Hazy Moon member Ralph Shikan Levinson recently published his first novel, a Chan-themed adventure story for children. 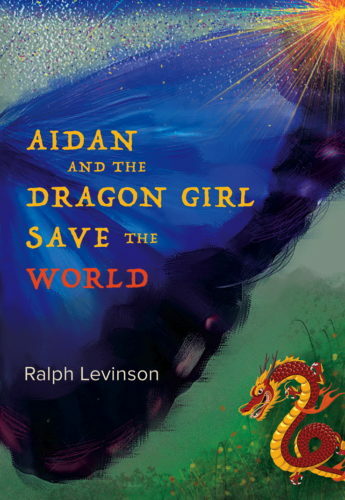 In Aidan and the Dragon Girl Save the World, 11-year-old Aidan Alvarado receives the key to his grandfather’s wondrous study and a student membership in the League of Dream Detectives. On his first adventure, Aidan discovers a magical world of Ancient Chinese wisdom, history and legend as he meets sages, a shape-shifting water spirit dragon, a greedy General, a ferocious bird as large as a jet fighter and China’s only woman emperor. Read an excerpt from Aidan and the Dragon Girl Save the World below. When his grandfather paused again, Aidan thought it was his chance to ask more about his birthday gift and the league of dream detectives. and told him to have a good trip. As he walked home, Aidan was lost in thought. Had the vase really been glowing? What could that be about? Aidan thought about how awesome it would be to figure out all the answers to those questions before his grandfather returned. thing his grandfather liked to say. Aidan was so busy trying to work out how he might solve the mystery of the vase that he only realized later that he didn’t even ask his grandfather where he was going on his trip or when exactly he’d be back. That night Aidan had a dream. He was in a cave. He thought he was alone when he suddenly heard a soft, raspy voice behind him. Aidan turned and saw an old man with leathery skin, wispy long white hair, and a white beard and mustache. The old man was sitting cross-legged on a rock. At first Aidan thought it was his grandfather sitting there, maybe playing some sort of trick on him, but he quickly saw that the man in the cave was much older than his grandfather, and more importantly, he was Chinese. The old man was painting a picture of a butterfly on a scroll that rested on his lap. When he finished the painting, the butterfly flew off the paper and flitted around Aidan. Aidan watched the butterfly continue its journey out of the cave into a lush meadow carpeted with colorful flowers, where it joined hundreds of other butterflies fluttering here and there, feasting on the sweet nectar the flowers provided. When Aidan turned back to look at the old man, he was gone, but the scroll was still there on the rock where the old man had been sitting. Aidan picked it up, expecting to see more pictures of butterflies. He was surprised to see a picture of the old man instead. He was even more surprised when the painted old man on the scroll started to move his arms in slow, sweeping gestures, the frayed sleeves of his dirty white robe gracefully opening like wings, as he spoke in a soft, whispered mumble. The old man landed back on the scroll, once again becoming a flat moving painting. He crossed his arms over his chest, as if hugging himself in delight. The old man on the scroll yawned and stretched as if he had just woken up. Aidan started to answer. Of course you know when you are awake. Everybody does. But the old sage on the scroll held up his hand to stop Aidan. Aidan thought that must be pretty obvious, so maybe the old man was starting to lose it. He did look very old and he wasn’t making much sense. Aidan woke up. Butterfly? Den East? The key to what? Were these some kinds of clues? Did they have anything to do with the mystery of why the vase was glowing? Aidan suddenly found himself sitting in front of Wise-and-Able in his small room, this time without the other two men. Aidan was proud that he was learning their ways. He was proud that Wise-and-Able said so. Aidan had to laugh out loud. This crafty old Wise-and-Able knew more than he was letting on.